Wow, what a week in Sydney we’ve had. I spent 5 of the days in a conference, but luckily the conference organizers had some fun and unique activities planned for us throughout our stay. We also spent a few days catching up with friends and seeing some of the sights on our own. Here are a few of my top picks if you have a few days in Sydney! 1) Taronga Zoo. It was my second visit there and went to Sydney knowing that I wanted to revisit it. It is a quick ferry ride from Circular Quay and it really is one of the best zoos in the world. You arrive at sea level and take a Gondola up to the top of the zoo. From there, you spend the day making your way down to sea level again to take the ferry back to downtown Sydney. The views of the Opera House and the Harbour Bridge are incredible. They have a wide variety of local Australian Animals as well as African animals like elephants and Giraffe and other exotic animals like Tigers, etc. You could spend a few hours or a whole day, depending if you want to catch any of their shows. A family pass to the zoo including the ferry, etc for 4 people is $150.00 AUD. 2) Sailing on Sydney Harbour. 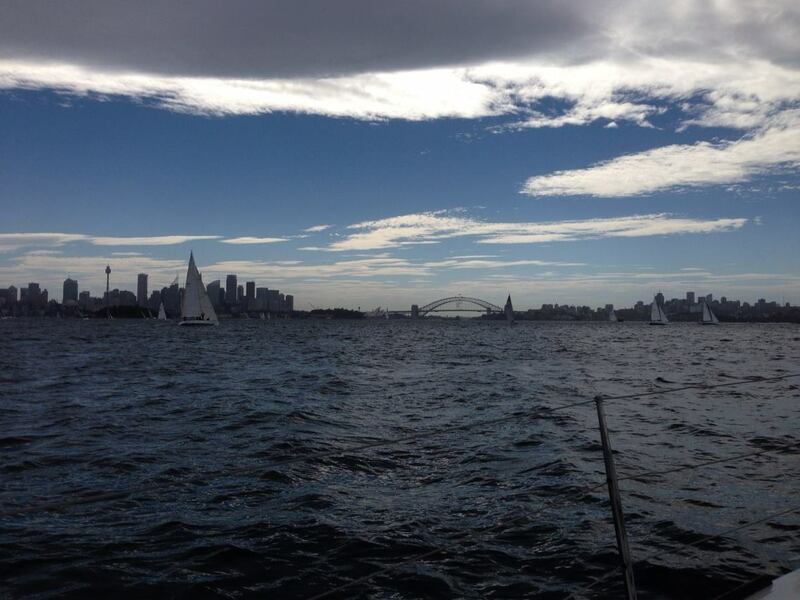 You can learn to sail with an experienced sailing company right on Sydney Harbour. Your afternoon adventure with East Sail has you going on board with a skipper and your crew of new sailors-to-be. You learn a few basics, then you have two races against their other sailboats. You get to do everything from steering the sailboat to pulling and letting out the ropes (I wish I remembered what it was all called!) It was something I wouldn’t have done on my own but it was a blast – unexpectedly my favorite thing I did in Sydney. I am not sure the cost is as this was included in our conference rate. 3) Sydney Aquarium. We spent about 3 hours here with the kids and could have stayed longer if we weren’t all starving for lunch. They have tons of sea life – sharks, dolphins, Dugong’s (looks like a Manatee) Barrier Reef fish, all kinds of Sting Rays, octopus, Platapus, sea horse, penguins, etc. It was fabulous and the kids loved it. It was about $26.00 AUD for adults and $16.00 AUD for kids if you bought the tickets online – they were more at the door. 4) Darling Harbour. I didn’t go over to Darling Harbour on my first visit to Sydney and that’s a shame. It is a beautiful harbor with some excellent restaurants, the Aquarium, Sydney wildlife Park, shops, a large playground, the Maritime Museum and more. You could easily spend a day or two exploring this area and enjoying the views. 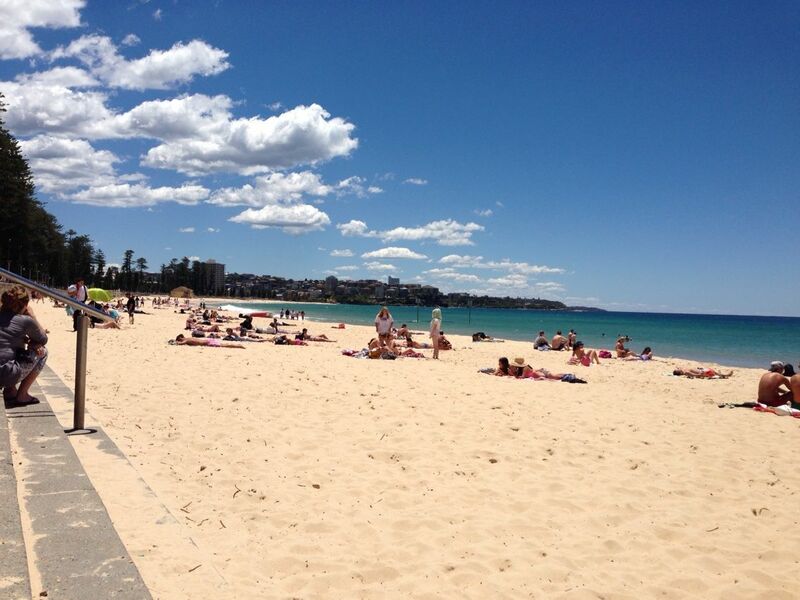 5) Manly Beach. This was also new for me. You can take a fast ferry – about 20 minutes – over to Manly Beach from Circular Quay. It is $12.00 AUD each way. When you arrive, you can walk along a pretty little street full of shops and restaurants over to Manly Beach. It is beautiful – stunning. Just what you think of when you picture Australian beaches. Sugary white sand and water that’s every shade of blue and green. You can learn to surf there, go scuba diving, find great shopping and restaurants, or just enjoy the beach. We walked along Manly beach to a second little side beach called Shelley Beach and had lunch at a restaurant called Le Kiosk. It is tucked out of the way with incredible views of the beach. The food was excellent, but just make sure you aren’t in a hurry as the dining process there is meant for you to take time to enjoy the food and views and not rush through. It was a very busy little spot – I think reservations would be a must. Sydney remains one of my favorite cities. The people are welcoming, there is lots to do and it had a clean, safe feeling. It is also a very expensive city – quite a bit more than being at home and even quite a bit more than being in Hawaii. If you go, you will need to budget accordingly. It was hard to have a meal for 2 adults and a child that was under $100.00. We are now back in Hawaii – our last night in Honolulu at the Outrigger Reef on the Beach, before we fly home tomorrow evening. I have the patio doors open and I can hear the Hawaiian band playing in our outdoor hotel lounge. I will be sad to leave and return to the -40 temperatures of Saskatchewan, but I guess no one can be on vacation forever…. Wailea has the upscale and posh shops that this gal likes. Not to mention the gorgeous golden beaches and amazing Hawaiian sunsets to boot. When we first drove up to our new resort, Grand Champions Villas, it was obvious that we were in a more expensive part of Maui. Our resort is surrounded by beautiful golf courses and mansions. We are walking distance to the Shops of Wailea which spells big trouble for me and my credit card. Thankfully, my husband is distracted by all the golf courses and hasn’t noticed me putting us into potential financial ruin. For fun, we went on a snorkelling trip to the Napili area. Renting snorkelling gear was easy and cheap enough from Snorkel Bob’s just down the road from our hotel. After driving North to Napili, we entered the warm ocean to swim with massive turtles! It was so cool having 8 huge turtles swim freely around us. We have some amazing underwater shots of them. Last night, we had an awesome time at the Old Lahaina Luau back in Lahaina town. Although there are plenty of people there making the lineups long to enter, it was a very enjoyable experience. There is not a bad seat in the place and there are different exhibits to enjoy before the show and meal begin like a hula station to show you how to dance and a music station demonstrating their local instruments. The meal and the traditional Hula dancing was a nice way to put an end to our Maui vacation. Mahalo for reading my blog! The beautiful island of Maui is where I begin my next adventure. It’s my first time visiting this tropical paradise and I’m in love! The people and the Polynesian culture are so very rich and inviting. We have met so many wonderful locals with great tips on the best snorkelling spots and restaurants. Driving around is a breeze and it’s important to have a rental car to see the sights. We started out by spending a few nights in the small beachfront city of Lahaina. I love the small town charm and neat stores and boutiques. Lots of great restaurants are walking distance from the Outrigger Aina Nalu, our condo styled resort only blocks away from the town centre. Staying in a condo has its perks like saving money on meals. We aren’t far from a grocery store and managed to grab some breakfast and lunch items for later. Saving money like that means we can spend more money on fancy seafood restaurants! Being a seafood fanatic can be an expensive habit. Thankfully, there are great deals to check out. Like $1 oysters at Fleetwood Restaurant with a rooftop view of the ocean and the surrounding mountains. They were delicious! Jamie’s Hawaii and Australia Adventure Part Three – Hawaiian Airlines Coming Up Roses! First of all, I have to admit I am a terrible flyer. Most people are surprised by this, given that I own a travel agency and I have been in the travel industry for over 15 years. I hate flying, I am terrified of turbulence, I get sweaty hands and at can’t wait to get off the airplane at the end of a flight. I have never flown Hawaiian Airlines before and I was a bit skeptical (and nervous)… I was sure this would be some sort of second rate-discount-airline that would not have my safety and comfort as their top priority. However, they were the only airline flying direct Honolulu-Sydney on the days I wanted and they were a good price, so that’s how we came to have a reservation on Hawaiian Airlines. I have to say, I was very pleasantly surprised! The check in staff was very helpful. Please make sure to get to the airport in Honolulu at least two hours prior as they suggest – the security lineups were very long and we stood in line about 45 minutes. The in flight crew and staff were very friendly and polite and they took extra time to make sure Sydney was comfortable and felt special. I had ordered a special children’s meal ahead of time for Sydney (complimentary) and it was chicken nuggets and tater tots and fruit salad – perfect for a kids meal. The adult meal was also quite good – surprising by airline standards. It was an Asian chicken stirfry with asparagus and rice, plus cheesecake and a salad. They came around with a snack later in the flight which was sandwiches, cookies and macadamia nut chocolates. They also had complimentary drinks including wine and beer throughout the flight. In between the meal services, they had snacks for purchase in the galley. They have personal in seat entertainment units (not standard on all flights, but I think it’s standard on most of the long haul international flights.) They had a selection of movies, music, tv shows and games for free, plus a few new releases at an additional cost. There was no problem finding something to pass the time. It was an 11 hour flight…I watched three movies and read the rest of my book and we were there! My only complaint is that the leg room was not quite what I would have liked. If I had anything at all in my seat pocket, my knees were touching the seat in front of me. However, the seats reclined quite a bit and had adjustable head rests which made it nice for napping. They also gave everyone a pillow and blanket. All in all, Hawaiian gets two thumbs up from me and I am quite happy to be flying them back to Honolulu next Friday night. We arrived in Sydney in the evening and took a taxi from the airport to our downtown hotel (about $45 AUD). Check in at the Four Seasons was very quick and efficient and our room was as requested with a king bed and a cot all made up for Sydney. The room is quite large with a really nice bathroom. They provide adaptors which is a bonus and there is a DVD player and very large flat screen TV. They have complimentary bottled water in our room – replaced nightly and they include breakfast and WIFI. My only complaint about the room is it seems quite dark. The lights are all covered in a very dark shade and there aren’t enough lights in the ceiling. Ironing was a bit of a challenge when I couldn’t see where the wrinkles were! The included breakfast at the Four Seasons was very good – buffet style but made to order eggs and lots of fresh breads, baking, fruit, eggs benedict, bacon, pretty much everything you could want. I am thankful for the included breakfast since the costs in Sydney have not gotten any better since I was here a few years ago. Caesar Salad at the hotel is $28 AUD and at a restaurant on Darling Harbour it was $18 AUD. Pasta was $24-$30AUD for lunch and a glass of wine starts at $13 AUD – beer starts around $9 AUD. Considering the AUD is pretty close to being on par with the CAD, the prices are quite a bit higher than at home. Tomorrow we will check out the Aquarium and do a bit more sightseeing before my conference starts on Monday. 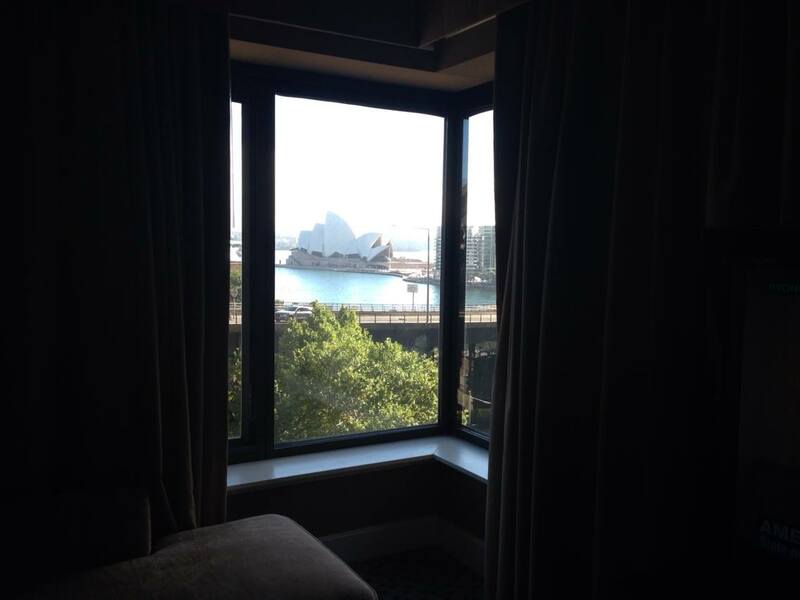 It really is a beautiful city and the view of the Opera House out our window can’t be beat!